Jobber has added the ability for your clients to approve and request changes to quotes through your client hub! This update is going to help you communicate with your clients more effectively. No more waiting for texts and phone calls. ? Now getting quotes approved is quick and easy! ? When your clients review a quote in client hub they will now see an option to ‘Approve’ or ‘Request Changes’ in the top right-hand corner. 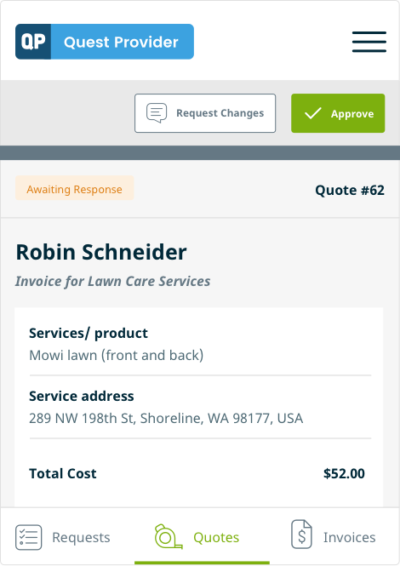 You’ll also see a few new statuses on quotes in your Jobber account that will give you a better understanding of what steps your client has taken toward booking your services. If your business requires signatures to move forward with work, we’re also adding the option for you to collect a signature when a client clicks ‘Approve’ on a quote. Signatures, combined with the ability to collect a quote deposit via Jobber Payments will help increase client commitment and prevent last minute cancellations. Requested, estimated, and signed in less than 5 minutes!!!!! No more waiting for snail mail contracts! Love it! With this update, we recommend that you and your team keep your Jobber App up to date with the latest version to avoid any interruption with your workflow. Looking for resources to help you write the perfect quote? Check out our Jobber Academy Resources on breaking down the quoting process and why you should follow up on your quotes. Ready to try quote approval?